Some might call it 20% Time. Others call it Passion Time. My first encounter with it was as “Genius Hour,” and so I’ve kept that label. There are many versions, and many recommended ways to do it. The crux of the matter, however, is that many educators have found that it is important to allow students to pursue studies in topics that interest them and have relevance to their lives. 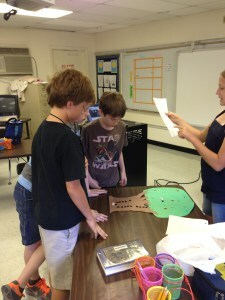 I began doing Genius Hour several years ago with my GT 5th graders. This past year, I expanded it to 3rd and 4th grades. Every year, and with each grade level, I’ve done things a bit differently. But I continue to do it because I have definitely seen the value. I can’t imagine my classroom without Genius Hour – and once I introduce it to a group, they will not stand for it to be taken away from them. If we ever miss it because of scheduling conflicts, I have a near mutiny on my hands. You can see my Genius Hour Journey by going to the Genius Hour Resources page (there is a tab at the top of this blog). I also have downloadables (I highly recommend the Challenge Cards – a big hit with my class this year! ), as well as links to other fabulous Genius Hour Resources. Scroll down to the bottom of the page, and you will see some recommended articles for “newbies” to Genius Hour. Genius Hour is messy. It’s loud, and there is absolutely no sitting down on the teacher’s part. Most of the time, your students are learning about topics in which you have no expertise whatsoever. It can be frustrating and extremely challenging to your sanity. But, once you see the impact it has on your students, you will find that it changes your philosophy of teaching. And, even the moments that are not dedicated to Genius Hour in your classroom will slowly become more student-centered and more meaningful.